Subscribe to Steam World magazine, Britain’s best-selling historical railway title, if you're fascinated by fine engineering and the UK’s exciting social and industrial history. Featuring lively photography and all of the latest news on restoration projects and upcoming events, this is a truly unique history magazine. You’ll also find interviews and articles by specialist railway personnel, including British Rail managers, train drivers, firemen and other enthusiasts who share your passion. Published monthly, this is an intriguing read for those who remember riding steam trains, and a great way to introduce your offspring to the golden age of rail travel. Steam World relives the glorious days when Britain’s steam railways were the lifeblood of the country. Combining the very best pictures with accounts from drivers, fireman, BR managers and enthusiasts the heydays of British steam are brought back to life. 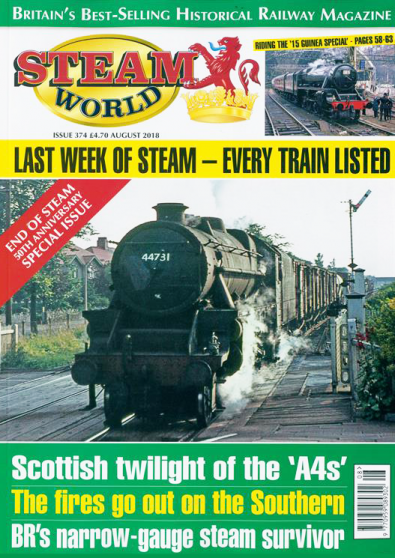 Steam World magazine is packed with stunning pictures from the fifties and sixties which are guaranteed to bring back magical memories for those were there, but will also thrill those who are too young to remember mainline steam. Steam World is as real as it gets. A unique section of Steam World magazine is letter pages where readers can share memories and keep in touch with old friends. Be the first person to tell us what you think about Steam World and you'll save £2.50 on your next purchase!